Many people mistakenly confuse the term long tail keywords as meaning search terms with lots of words in them. In fact, many search terms containing lots of words are at the head of the search graph, long tail means something completely different. The graph below illustrates the distribution of search terms around a specific subject. Let's use the car insurance market as an example. At the head of the graph terms such as "car insurance" (673k searches per month in the UK) "cheap car insurance" (165k searches per month in the UK); thanks to SEM Rush for the data. As you move along the distribution curve you'll see terms such as "multi car insurance quotes" (7k searches per month) and "car insurance for teens" 900 searches per month. The mistake many people make is they assume the search terms with the lower volume, the number of times the term is used per month, are long tail keywords, and they're not, they are just search terms with lower monthly usage. The truth is, if there's data for a search term, any data, it's not a long tail search term, it's just a search term with low volume. The danger is people then conclude the terms with low volume are long tail and will be easier to rank for. This is wrong. OK, I'm Being Pedantic, Or Am I? It's true that, in general, search terms at the head of the distribution curve are shorter, fewer words, but it's also true that some multi-word search terms are at the head. 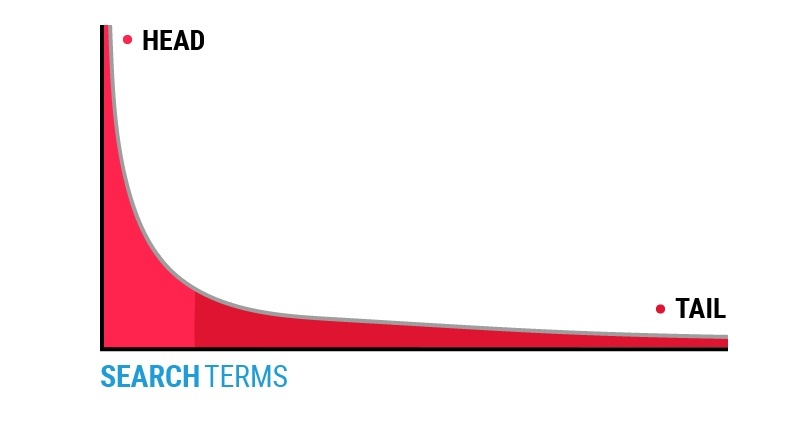 It's also true that as you move down the distribution curve the search terms get longer but that doesn't make them long tail search terms. Back in 2010, Jill Whalen suggested, quite rightly in my view, that you can't optimise for the long tail of search. She argued that true long tail search terms are searched so infrequently it would be impossible to optimise content for them. In simple terms, you can't create and optimise a page for a search term that's only used 4 or 5 times a year, terms that really are in the long tail. For clarity, in my opinion, search terms containing several words that have low but measurable search volume might be easier to rank for, but they might not, but they are not long tail search terms. They're sort of fat tummy area search terms and while they may well be worth tickling, you might find they're not ticklish. An example of a fat tummy area search term is how to build a lead generation website. Some would argue this is a long tail search term, but it isn't. Yes it's got lots of words and yes the search volume is low at circa 10 per month, but it's not a long tail term. So How Do You Attract Long Tail Search Traffic? This then leaves the thorny question of how to go after all that great search traffic that exists away from the head and tummy, in the tail. The search terms that have no search volume data. The answer's simple, kind of, and it's all about content. Websites that have lots of (fantastic) content use lots of words and phrases. This means that inadvertently from time to time those words and phrases will match, either exactly or at least closely, a search term being used by someone in Google. All things being equal, that will lead to appearing in the search results and the possibility of receiving a visitor. Boom. We've been advocates of producing great, truly useful content, for years. Every day we reap the benefits of all the articles and blog posts we've written through the leads or enquiries we get from our website. Great content really is the gift that keeps on giving. Having said that, most of the content we produce is created with the purpose of trying to rank for specific search terms, terms in the head and tummy of the search distribution curve. After all, what's the purpose of a blog if not to try and attract more potential customers to your website? What we don't do is chase these mythical long tail search terms. First of all, we don't know what they are because there's no data and secondly even our prolific content output wouldn't be enough to chase terms that only get used 3 or 4 times a year! If you're confused about how to generate enquiries from your website and your business would benefit from a predictable, scalable, repeatable lead generation machine, simply request a FREE website review and audit.